« Movember – please donate. Thanks to Sue at Desang Kit Bags for this update. 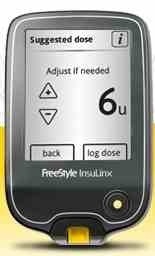 This is a brief email to alert you to the new accessibility to the FreeStyle InsuLinx meter from Abbott. 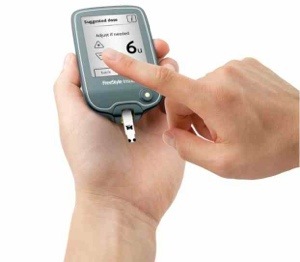 When originally launched, you could only get one directly from your diabetes nurse as it needs to be programmed around your own personal treatment programme. An access code was required to put this information in which HCPs had access to. However, now the meters are available direct from Abbott. The FreeStyle InsuLinx meter comes in a ‘pre-easy’ mode so you can use all the main tools. The code is only needed if and when you want to turn on the bolus Calculator tool, and the code can be given by your HCP at their discretion. You can add your own image into the phone as well as add various other personalized settings. It’s PC and Mac-compatible and comes with FreeStyle Auto-Assist software. The meter’s touch screen is icon-driven, so you press the relevant icon to get into that part of the set-up. There’s only one button, which acts as the home button, just like a mobile phone. Used one of these for 6 months – got through ~ 1000 tests with it. It’s OK, but not being able to adjust the dose criteria really does turn it into useless as a carb-count/bolus-advisor. The fact they’re using an old-fashioned liquid-crystal display (low res!) doesn’t help. Yeah, you need some intelligence to work it, but if you’ve manage carb-counting, MDI & background adjustment for a few years fiddling with this’ll be a doddle! Thanks for the reply, I have literally just received one of these meters so will give it a try over Christmas. I know what you mean by the display, I do reall like the Accu-Chek Aviva Expert as it is a great looking meter and does everything you would want, it is certainly a smart BG meter. I also like some of the new Onetouch meters which look very clever indeed.